ISS Africa | Election violence: should South Africa be worried? Home / ISS Today / Election violence: should South Africa be worried? Election violence: should South Africa be worried? In the last couple of weeks, South Africa’s major political parties have begun publishing their manifestos and candidate lists and positioning themselves for the municipal elections set for 3 August. At the same time, protests against the economic and political situation have continued across the country. The increase in protests – combined with a history of violence, structural inequality and growing frustration with the ruling African National Congress (ANC) – leads many to question whether South Africa would maintain its tradition of peaceful elections in August. Apart from some threatening behaviour directed at the Independent Electoral Commission (IEC) during the national elections of 2014, election violence does not have deep roots in South Africa. That said, protest has become a part of daily life, increasing since 2010 (see Figure 1). These protests are linked to service delivery, demarcation, labour, university fees and staffing – and, since last year, protests directly calling for the resignation of President Jacob Zuma. The mobilisation of protest and its coverage are increasingly politicised. The South African Broadcasting Commission (SABC) recently announced that it will no longer air stories about violent protest, with the intent to reduce publicity of the perpetrators and instigators. This decision provoked widespread criticism, with many saying it amounted to outright censorship. Although there can be little doubt that a copycat effect exists and that scenes of violence and outrage may serve to instigate the same elsewhere, social media can readily bypass efforts at media control. In addition, the direct engagement and support of the Economic Freedom Fighters (EFF) in the so-called ‘fees must fall’ student protests is an example of how protest can be politicised. Protestors are by nature more easily co-opted by politicians and media; which is a cause for concern in the pre-election period. 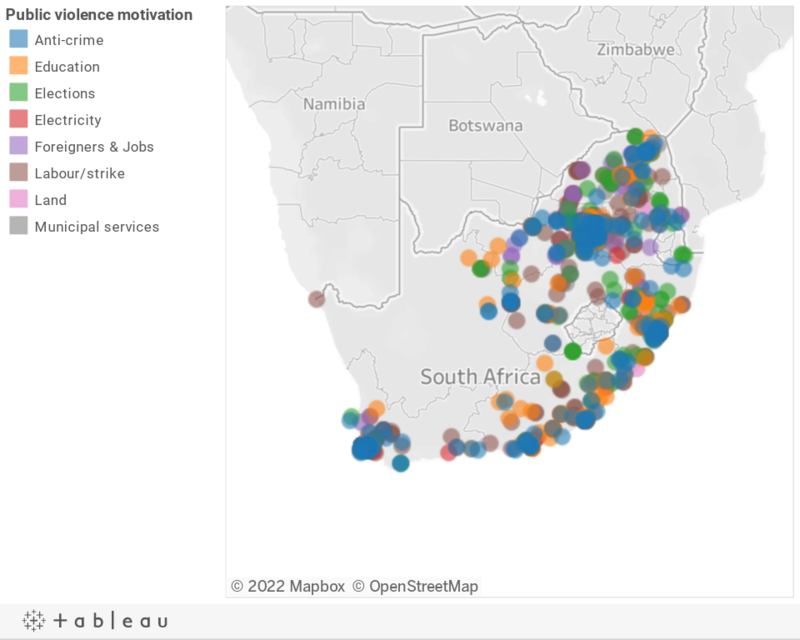 Analysis of the ISS Public Violence Monitor data from January 2013 to December 2015 suggests that South Africa sees an average of three protests per day (including labour strikes). Election-related violence occurs frequently in many Africa democracies. Electoral processes are more likely to turn violent in settings characterised by latent conflict, systemic grievances and tensions surrounding political competition and power-sharing agreements. Another driving factor is when governments are actively factional in favouring one ethnic group above others. The 2007 national elections in Kenya were some of the most violent on the continent: more than 1 200 people were killed and over 350 000 were displaced. These events showed that politicians can and do mobilise citizens to engage in illegal and violent behaviour in order to bolster support and suppress the opposition. This has also been evident in South Africa, where instigation by local councillors is apparently behind the burning of over 25 schools in Malumele in Limpopo Province over a rezoning dispute that would seen them lose their jobs. The damage led hundreds of children to miss school and will cost millions to repair. Yet, so far, South Africans have voted peacefully since democracy took hold in 1994. Will the country be able to maintain this tradition or should we be worried? Some analysts have voiced concern that the upcoming elections could be the most violent in South Africa’s history. A recent study by the University of Georgetown suggests that historical conflict factors, structural risk factors as well as election-specific factors can help to explain a country’s risk of experiencing election-related violence. South Africa is a violent country. Given the history of apartheid, violence is a learned expression of grievance, and is often used as a form of communication across and within communities. 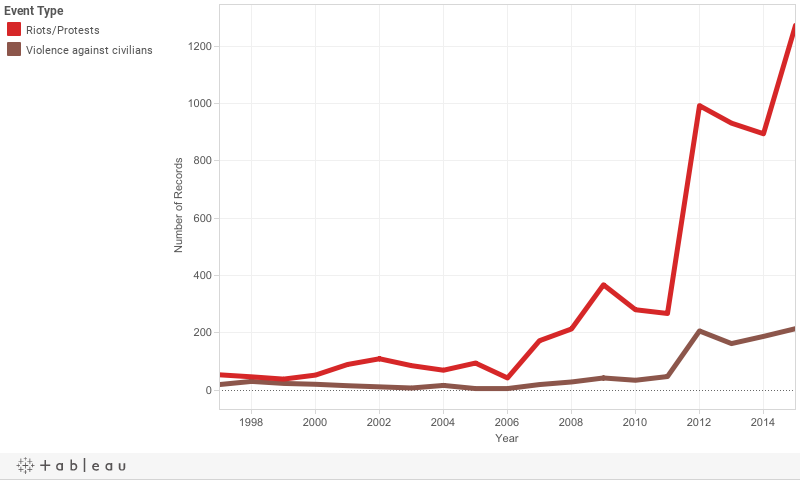 Looking at the crime data since 2000, murder rates – a common measure of overall crime levels – peaked in 2001/2002 at 47.8%, then reached their lowest levels in 2011/2012 at 30.2%, but have been increasing since. All forms of armed robbery have increased since 2011/2012, while vigilantism and xenophobia are ongoing challenges. Structurally, South Africa has the highest inequality in the world and a staggering unemployment rate of nearly 25%. In addition, 53% of the country is defined as ‘poor’, or living on less than R779 per month in 2011. The bottom four deciles of earners are predominantly black, living in rural areas or informal urban settlements. There are few rungs for households to move up the income ladder. Government’s extensive social welfare programme is only able to ward off extreme poverty and cannot reduce inequality without rapid growth and job creation. The looming junk status downgrade by international financial agencies has been avoided to date, but many predict it can’t be held off for long. This will affect investment and therefore growth. South Africa’s structural inequality is inextricably linked to its social instability. Simultaneously, the movement calling for Zuma’s removal and an end to the corruption, nepotism and cronyism rife in the Executive has seen up to 10 000 protesters gather, in some instances. The Nkandla scandal revealed the president’s intent to ignore his constitutional obligations, and the behaviour of the rand following the firing of Finance Minister Nene in December 2015 was merely one example of the damage that these actions inflict on the country’s prospects. Unsurprisingly, Afrobarometer 2015 survey findings show a steady decline in trust of public institutions over time, with trust in the Executive experiencing the steepest drop. Only a third of South Africans are said to trust Zuma ‘somewhat’ or ‘a lot’; down from a near two-thirds positive response rate to the same question in 2011. Meanwhile, opposition parties are growing in support and rigour. It is evident that change is wanted. Before the growth in protests, elections formed the main avenue to demand change in democratic South Africa. Whether people will participate in a peaceful and constructive way this August remains to be seen; but it seems there is a confluence of factors suggesting we may need to be more prepared. These factors and more are examined a series of three publications on the state of South Africa and its medium term prospects to be launched at the ISS in Pretoria on 21 June and in Cape Town on 29 June.